Cadillac CTS-V sets track record | What Car? 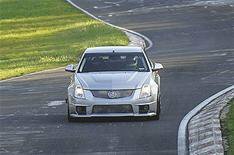 Cadillac claims its Cadillac CTS-V has broken the production saloon lap record around the famed Nurburgring race circuit in Germany. The CTS-V is powered by a 542bhp 6.2-litre V8 petrol engine, and lapped the 13-mile track in 7min 59.32sec, according to the American company. However, that's still almost 40 seconds short of the outright production car record, set this year by a Nissan GT-R. The CTS-V is scheduled to go on sale in the UK early next year.